Smokey Robinson was Christmas shopping with fellow Motown songwriter Al Cleveland when Cleveland let slip the malapropism “I second that emotion.” Intrigued, Robinson penned a lyric about a man disinterested in flirting, fishing for long-term love. In other words, it’s the complete opposite of every Kiss song ever. The arrangement and delivery is relaxed and easy. Never a forceful singer, Robinson lets the horns punctuate his pleas. His vocals are soft and comforting as a pillow, while Miracle Marv Tarplin’s guitar pulls the song over the unusually subdued percussion. There’s no climax or resolution to the number – the horn breakdown in the final moment is as close as we get. It’s almost like Robinson is auditioning the idea. 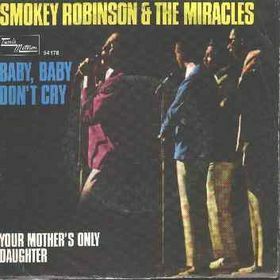 The song fades before we learn the woman’s reaction, but audiences were delighted, sending “I Second That Emotion” into the Top 5 and earning the Miracles their sixth million-selling single. Less than two years later, Diana Ross and the Supremes and the Temptations teamed up for a television special and album. “Diana Ross and the Supremes Join the Temptations” featured their interpretation of “I Second that Emotion,” which was a Top 20 UK hit (the single was not released in America). The album marked the debut of new Temp Dennis Edwards, who replaced the troubled David Ruffin. Miracle guitarist Tarplin reprised his role for the all-star revision. The song has a diverse cover life, with performances issued by Jerry Garcia, ‘80s synth band Japan, and “Stand By Your Man” country singer Tammy Wynette.